Mass Effect: Andromeda has built on the co-op mode of its predecessor, giving it a slightly different feel than Mass Effect 3, but retaining a lot of what made that mode a ton of fun. 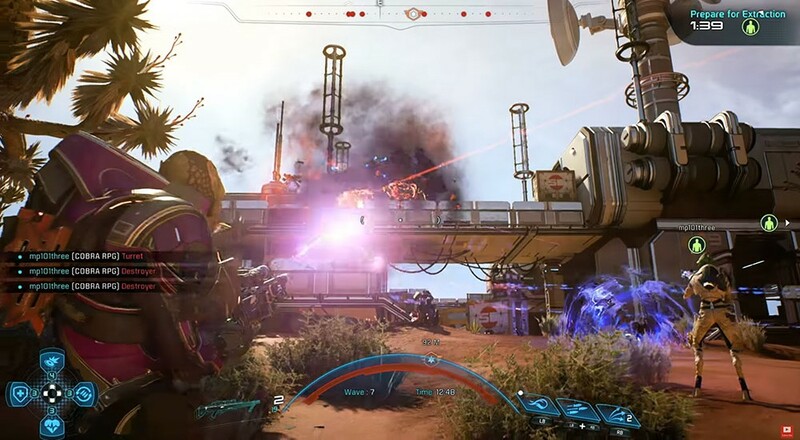 Combined with the new cover and movement system the action oriented nature of Andromeda's four player co-op mode is a solid, if often frustrating, shooter. The most frustrating aspect of the mode is still the dependency on having all four player slots filled. Mass Effect: Andromeda does not scale its missions to the number of players - meaning you'll be forced to fill a game with public players if you only have one or two friends handy. The mode itself starts with almost a fighting game style roster of characters to choose from, each one you level up and customize to your liking. You also earn experience towards an overall multiplayer level which unlocks further bonuses. On top of the character customization you'll be earning currency towards purchasing chests of cards. These "cards" unlock further characters, weapons, consumable items, and other trinkets to help with your co-op conquests. Of course if you so choose, you can plop down real dollars and unlock these chests faster than grinding through a few play throughs. Cards stack upgrading existing weapons and items for further enhancement. Finally the missions themselves have multiple levels of difficulty yielding replayability and higher rewards. You'll face off against 7 waves of enemies with various objectives like hacking, defending, assassinating and just plain surviving...which isn't always easy. We'll have a full review of Mass Effect: Andromeda as well as a co-op FAQ shortly. Page created in 0.2562 seconds.